Currently, DirectoryEngine, EstateEngine, DiningEngine, ClassifiedEngine and JobEngine support in importing users’ information from Google Map to their profile. Where? Engine Settings > Settings > Map API. How? Simply enter your API Key in the Map API Key mode. 1. Go to https://console.developers.google.com/apis/library to create your Google Map API Key. 3. Fill in required information involved in your project. You can provide any name suiting your purpose; however, you should name your project as “ Gmap-api” for the first step. Besides, don’t forget to click Create to submit. 4. On the Credentials page, click the Create credentials drop-down list, and choose the API key option. 5. Select Browser key in the Create a new key dialog box. 6. In the Create browser API key, you enter a name for your key and your domain(s). Then, click the Create button to submit. *NOTE: The domain MUST follow the format *.yourdomain.com/*; EngineThemes will enter *.enginethemes.com/* for example. 7. Copy the Google Map API in the API key dialog box to your site. It locates at Engine Settings > Settings > Map API Key. 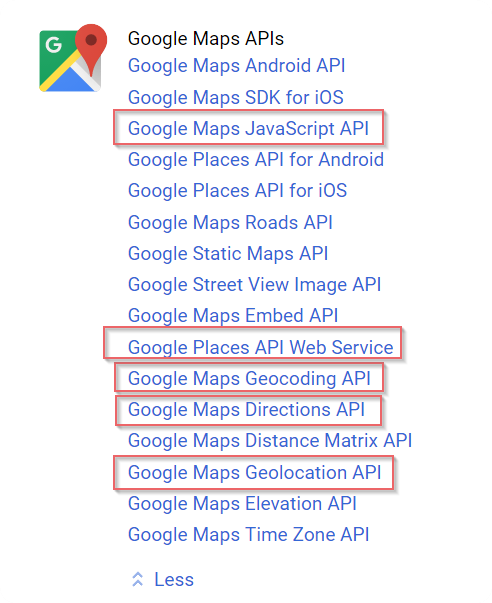 Besides, Google has removed their Geolocation API from unsecured origins and this means Chrome, Firefox, and other browsers no longer support obtaining the user’s location using the HTML5 Geolocation API from pages delivered by non-secure connections. This also means that the page making the Geolocation API call must be served from a secure context such as HTTPS. Concerning this issue, you can visit this link to get a closer look at how it changes and its effects for reference. Above are all about steps to set up Google Map API. Should you need any problem during the setup progress, please visit our forum http://forum.enginethemes.com/ for further help.